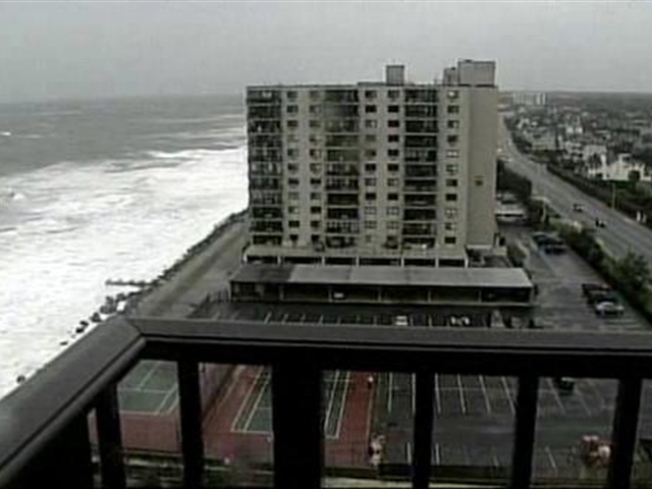 Labor Day is a distant memory right now for the Jersey Shore, as the remnants of Hurricane Ida sweep up the coast. "I was blowing over," little Alexis Hiner of Long Branch said on the Pier Village boardwalk on Day One of what could be a three-day ordeal. Back bay flooding with closed roads was reported in South Jersey, and in Spring Lake, as heavy sands washed up onto Ocean Avenue. In Monmouth Beach, huge boulders lying in the sand for a sea wall repair project were tossed around like so many conch shells in a beach bar. And just about everywhere there has been past flooding, police and DPW workers were posting 'flood warning' signs again. "I came to this beach in the summer. It was a nice flourishing beach," said Kathy Heiss of Fair Haven, standing just feet away from the foam-topped surf in Sea Bright. There, sand fences intended to build up the dunes were instead floating like yesterday's flotsam in the raging surf. While beaches almost always build back up again by the end of each May, they never come back as strong as they were the year before. And that has to worry tourism officials, since there's a potential for many more Nor'easters this winter.